A small but perfectly-formed district in central London, Pimlico is a fairly wealthy and extremely well-located neighbourhood that’s home to almost 40,000 people. Pimlico’s environment is safe, calm and very residential, so despite its central location, it can be easy to forget that you’re in London at all! This makes for the perfect retreat to allow you to truly relax whilst not leaving you with any long commutes. Read on to find out if Pimlico is the ideal area for your London homestay accommodation. Bordered by the Thames to the south, Westminster to the north and Belgravia to the west, Pimlico is a centrally situated neighbourhood with an SW1V postcode. It sits within zone one on the Transport for London network and was built originally as an extension to Belgravia. What’s the typical accommodation type in Pimlico? Pimlico is well known for its garden squares and traditional Regency architecture. These 19th century homes look stately and bold with white and beige facades. Original features such as columns either side of the front door, wrought-iron balconies and bow windows are still commonly seen. These townhouses are roomy by today’s standards and some have since been converted into flats and apartments. Those who can afford a property in Pimlico are rewarded with quiet, tree-lined streets and plenty of space indoors; both of which are quite unusual for the capital! Frequented by families and high-net-worth individuals, Pimlico is considered extremely safe amongst London neighbourhoods. It can be less populated than other such central areas and so is quiet in the evenings and at night. In the event you do feel uncomfortable walking along quieter streets by yourself, there are plenty of public and private transport options to get around safely. What type of people live in Pimlico? Pimlico’s property is pricey, and so those residing within it are normally of the British middle or upper classes. All of the schools in the area are highly rated by Ofsted and so many families choose to live in this area. Local estate agents report that the district also attracts high numbers of Europeans, primarily French and Italian, who prefer a leafy suburb to concrete and congested streets. The areas proximity to Westminster also means that several members of parliament live here, alongside a few celebrity faces. Previous residents include Winston Churchill, Laura Ashley and Swami Vivekananda. What transport links does Pimlico offer? The London Underground station in Pimlico sits on the Victoria line, with the main hub the next stop up the line. The area is also served by the Millbank Millennium Pier with regular boats to Waterloo and Southwark, and numerous buses run through the district. For national rail services, Victoria station offers connections all across the country and the capital’s coach station is also situated there – with not just national buses available, but international services too. What is there to do in Pimlico? Pimlico is undoubtedly a quiet, residential neighbourhood, but that’s not to say that you need to leave the area to find something to do with your spare time. There’s still plenty to explore! Tachbrook Street Market is a small world food market offering a variety of street food to be eaten on the kerb or back in your home. Present Mon-Sat from 10am through until about 6pm, you’ll find fresh cuisine from Thailand, India, Turkey, Japan and Jordan, as well as traditional greengrocers and fishmongers stalls. Every Sunday, a car boot sale takes place inside and outside of the Pimlico Academy. Being an affluent area, it’s reputed to be a great place to grab some real bargains as residents sell off their second-hand goods. Entry is £1 (or £5 for early-birds awake and ready to shop until they drop!). Car boot sales are rare in London, so take advantage while you’re there. Local drinking joint Cask is considered one of the best watering holes in London, with cicerone-accredited staff and a range of beers and ciders from around the world in bottles and on tap. Staff here are extremely well trained and more than happy to share on their knowledge, so you can make a social drink into a real learning experience. Perhaps not the most exotic meal you’ll experience whilst in London, this will definitely be one of the most traditional. 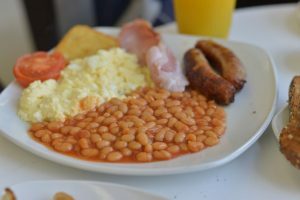 Regency’s Café is a favourite amongst locals and serves up British fry-ups all day long. Be warned: it gets busy, and it’s loud… but it’s worth every second! If you are an international student, intern or professional looking for homestay accommodation (“host family”) in Pimlico or close by, we would love to hear from you. Similarly, if you have a spare room in your Pimlico home and are interested in hosting international students, please do get in touch with us.